Here it is – the all-new Volkswagen Polo Mk6, said to be bigger, better and more advanced than ever. From looks, interior practicality to active safety systems, the Polo takes a significant leap forward for its sixth generation. Starting with looks, the Polo progresses in a typical Volkswagen fashion – it’s the little details that count. 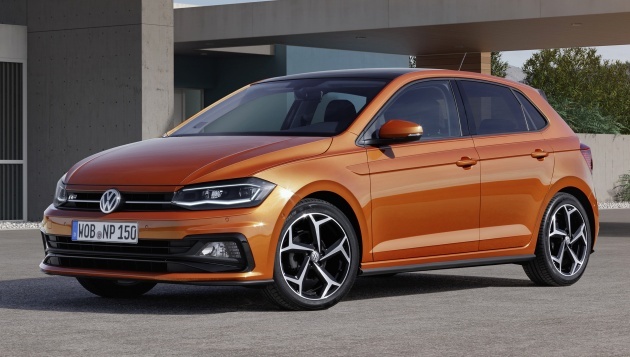 At the front, the grille and headlamps (now with optional LED units available) are placed lower than before, which Volkswagen says forms a distinctive new face for the Polo. On the sides, it now features multiple sharp creases, with arrow-shaped ‘tornado’ double lines making it look far more defined than before. The lines neatly extend into the LED taillamps, forming a more three-dimensional look overall. Gone, however is a three-door option – the Polo is now available with a five-door body style only. The usual Trendline, Comfortline and Highline trim levels are joined by the Beats special edition (with an uprated audio system plus unique badging), sportier-looking R-Line and the actually-sportier Polo GTI variants. A total of 14 exterior colour options are available, with 12 wheel designs (14- to 18-inch in size). A move to the modular MQB platform brings about big changes to its proportions, with a wheelbase now stretched by 94 mm. Length has increased to over four metres (4,053 mm) for the first time, with Volkswagen drawing comparisons to the Golf Mk4. Refer to the table below to see how it compares to the 1997 Golf and the outgoing Polo Mk5. This translates to a more spacious interior and a significantly bigger boot – now 25% larger at 351 litres, up from 280 litres. The much longer wheelbase also contributes to an improved ride comfort, claims Volkswagen. Inside, the Polo sees a major makeover – a revolutionary one, according to its designers. Out goes the old model’s vertically-oriented dashboard layout, replaced with a fresh horizontal architecture. There are 13 dashpad colours and 11 seat covers available this time round. Also new is the second-generation Active Info Display, making its Volkswagen Group debut here on the Polo. The digital instrument panel features more information, a more logical structure and even better clarity. Users can now ‘drag’ functions on the glass-encased centre infotainment system into the Active Info Display screen. There’s also a wireless charger for your smartphones. 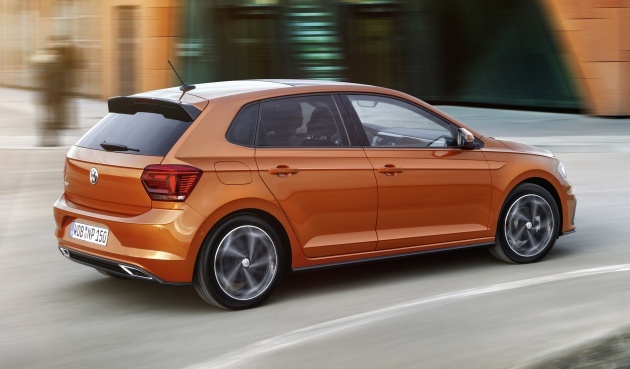 On the technology and safety front, the Polo gains a Front Assist area monitoring system with City Emergency Braking and Pedestrian Monitoring – standard on all European models. A new Adaptive Cruise Control system is available as an option, which includes a Stop & Go function. Blind Spot Detection and Rear Traffic Alert, plus Park Assist with manoeuvring braking function can also be had. Lastly, the engines. Nine Euro-6 engines are offered in Europe: 1.0 TGI with 90 PS (runs on natural gas), 1.0 MPI mills with 65 PS or 75 PS, 1.0 TSI with 95 PS or 115 PS, 1.5 TSI Evo with 150 PS, 2.0 TSI with 200 PS (on the Polo GTI), 1.6 TDI diesels with 80 PS or 95 PS – with a choice between five/six-speed manuals and a seven-speed dual-clutch DSG. In Germany, the base Volkswagen Polo Mk6 starts from 12,975 euro (RM62k), which Volkswagen claims represents a significant price advantage compared to the previous model when adjusted for now-standard options. Preferring to drive cars rather than desks, Hafriz Shah ditched his suit and tie to join the ranks of Malaysia’s motoring hacks. A car’s technical brilliance is completely lost on him, appreciating character-making quirks more. When not writing this ego trip of a bio, he’s usually off driving about aimlessly, preferably in a car with the right combination of three foot pedals and six gears. I just fall in love with the interior. DSG doesn’t work. Why don’t they understand? Planes used to not work. Now they do. Pretty much everything related to technology used to not work at some point. VW have released an unfinished, underdeveloped product. Perhaps now it is fine. We’ll see in a few years. Very best looking and engine performance. Love it. How on earth does VW create a car that looks just like the previous one and yet look so good? Enlarged in almost every aspect which is a good one. Definitely leaving the B segment and encroaching into C segment. Which makes it, what? B plus or a C minus? Is it? People who want a small car are complaining like mad, and I can understand them. It’s the main reason I bought a Golf and not a Mazda 3. The 3 is too damn big, and it offers nothing for that increased exterior space. Now they make headlamp shape like Saga2 FLX. Apa dah jadik ni? Volkswagen from German copying model of Proton from Msia? Make me laugh to dead. U donno anything bout proton tho. 13 color options, and there’s also going to be a standard option I suppose where it’s the usual black plastic. You’re going to have to pay for the orange anyway. Being VW you can probably make the Trendline look much like that if you want, but you’ll pay for it. If they bring in the GTI variant I would definitely grab it! All Ah Beng’s please go back to your workshops in Jinjang and Cheras. This is not the right place for you to comment. You need to get some education first. Please dont show off your tadika knowledge here. I agree. I am really sick of this Kunta Kinte fellow. looks good. cant wait for the next gen of jetta and arteon to arrive at our shores. Hopefully they do. When is expected arrival on our shores? Is this car already available in Malaysia? Went to a VW showroom and salesman insist the MK5 is the latest version. Salesman also said MK is for Golf only. WTH… I would have bought the car if he was being honest. When is this car coming to Malaysia?